The capital of The Netherlands, this bright, lively city is known for its canals, narrow buildings and bicycles. But Amsterdam is so much more than just for tourists. 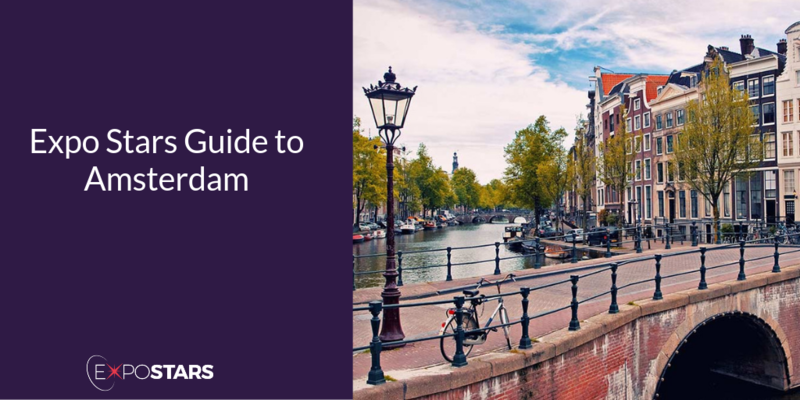 Its spirit of commerce can be found in all aspects of life, and thanks to its excellent quality of life, Amsterdam is a hub for talent, for startups and is the international headquarters of many global companies. Everything is close at hand and there is an extended network of internationally recognised service providers, able to offer you the competitive edge. Once you arrive at Schiphol International Airport, there is a direct railway line connecting the airport with Amsterdam Central Station, and is the fastest and most convenient form of transport to the city centre. Amsterdam Airport Shuttles (run by Connexxion) depart every 10 minutes, with services to more than 100 hotels throughout the city. Nothing may be brought into the country that might pose a threat to the security, health, economy or environment of the Netherlands. Check the list if you’re unsure. RAI - Amsterdam RAI is one of the largest exhibition and conference centers in the Netherlands. The city is famous for its historic homes, laid out in a pattern of concentric segments in the shape of a fan and built on piles driven through an upper layer of mud. Approximately 6,750 buildings dating from the 16th to 18th centuries are crowded into an area of 2,000 acres, dissected by 160 canals. Visit The Rijksmuseum - The Rijksmuseum was founded in 1809 to house the country's collection of rare art and antiquities. Explore The Anne Frank Museum - The museum is dedicated to the all-too-short life of one of the world's best-known Holocaust victims. Envy - Gorge on succulent lobster coupled with beetroot or try the Dutch gourmet sausages, they are quite an adventure. Bluespoon. Think handmade, truffle-touched gnocchi, cosily enfolded in egg yolk and Old Amsterdam cheese, with a tangle of salty Salicornia. Plug sockets are the European wide two pin ones. The Dutch are fond of meetings. The Dutch tend to get down to business and negotiations proceed at a rapid pace. Small talk is considered a waste of time. In Dutch business culture, it's typical to shake hands with everybody present and say your first and last name. A place to meet and celebrate NH Collection Grand Hotel Krasnapolsky is the ideal place to meet and celebrate. We create a memorable experience during a private dinner, product introduction, or any other unique celebration. Invite up to 1500 guests to your reception, and a conference organizer is on hand to assist you to arrange the day. Whether planning a large conference or celebratory banquet, benefit from full technical support, the latest A/V technology and an array of catering options. Work in style at the exclusive Executive Lounge and enjoy complimentary facilities and refreshments. The hotel also offers a dedicated business center with three private workstations, each providing a computer, internet access, audio equipment and a color printer. Secretarial services are available upon request. Hotel Okura Amsterdam is conveniently located close to Schiphol International Airport and within walking distance of RAI Convention Centre. You will find a total of 2,700 m2 (29,000 sq.ft.) of meeting space all on one floor. Most of the meeting rooms feature natural daylight. Planning a product presentation? Our heavy weight elevator ensures easy load-in and load-out of materials, even a car. Add the in-house audio visual support and private parking for cars and buses and you know your event is in good hands with this member of The Leading Hotels of the World where the sky really is the limit.